DINE IN, TAKE OUT, and CATERING - WE HAVE IT ALL! J.L. Trent's Seafood & Grill is a local favorite on Jacksonville's Westside, serving down home Southern style seafood and all the fixings for over 20 years. Trent's as known by the locals, was established by James Trent in 1997. James is a Jacksonville native and has been involved in the local seafood industry for more than 30 years. James' passion for serving the Jacksonville area quality seafood at affordable prices continues year after year. Trent's has a laid back atmosphere that is always family - friendly. We look forward to our family serving your family soon! J.L. Trent's Seafood & Grill has been family owned and operated since it was established in 1997. We serve amazing seafood, steak, pasta, and chicken. J.L. Trent's is conveniently located on the Westside of Jacksonville near NAS JAX, only minutes from I-295 off Roosevelt Blvd. * 2 for 1 Draft Beer, All Day Every Day * Healthy Grilled & Baked Options * Family Friendly Atmosphere * Great Food, Great Price, Great Service * Dine In, Take Out, and Catering Our newest location is in the heart of Downtown Jacksonville in the BB&T Building. J.L. 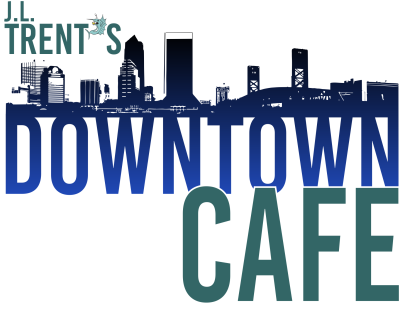 Trent's Downtown Café offers a variety of menu items including select seafood, burgers, salads & sandwiches.